Join the Posse! Get Charles E. Hurwitz behind bars. An immense tree once stood here. The following four public employees have the ability to launch criminal investigations against Charles Hurwitz. That they have not done so to this date does not mean that they can not be persuaded to in the future. Thank them for suing Hurwitz for $250 million in 1996 to reclaim a portion of the taxpayer bailout of Hurwitz's failed Savings and Loan. (See S&L Swindle for info). Now suggest that perhaps they should get some additional spine and pursue criminal charges. If everything they say in the lawsuit is true, then an indictment surely is in order. Janet doesn't seem to have any problem marching into Texas with tanks a firing and guns ablazing when the culprits are a few religious zealots. But why has Hurwitz's compound not faced Reno's heavy artillery? Ask her to use her office to go after some real criminals for a change. Tell her to ask her Fraud Division for some creative ideas. And refer her to the lawsuits filed against Hurwitz by the Office of Thrift Supervision and the FDIC. Senator Feinstein sits on the Senate Judiciary Committee, but you'd never know it by the way she cozies up to Hurwitz and offers him sweetheart deals worth hundreds of millions. Feinstein should be throwing indictments, not dollars, at Hurwitz. 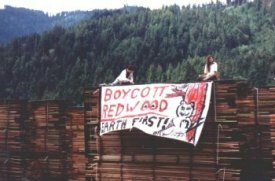 As a member of the Judiciary Committee, Feinstein should be asked to launch a criminal investigation and hold public hearing about Hurwitz's failed S & L and its connection to the takeover of Pacific Lumber. Barbara Boxer may be the most spineless on this whole deal. 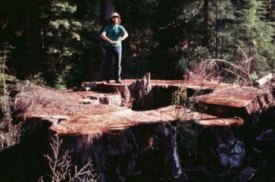 She introduced a Headwaters Forest Bill into the Senate in 1994 and did nothing to see it through to passage, even though it had passed the House of Representatives. Boxer sits on the Senate Banking Committee. She has the authority to motion for a Banking Committee investigation into Hurwitz's shenanigans. Why hasn't she usurped her full reign of power on this committee. Sure it's fine to investigate the Clintons for the Whitewater mess. But the Savings and Loan Hurwitz crashed cost the taxpayers $1.6 billion, thirty-seven times more money than the S & L the Clintons were involved in.